Family Built for Generations. Custom Homes. From custom built lakefront and country estates to subdivision developments and renovations across Norfolk, West Haldimand and South Brant, Boer Homes builds quality custom homes to exacting specifications. 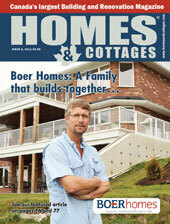 Design-build your perfect living space with Boer Homes. Our pre-designed house plans can be customized to suit your needs. From high quality finishes to energy saving features to meticulous worksmanship, every detail is considered in a Boer Home.